The bizarre incident occurred last year. The previously unreported incident occurred while Pruitt was living at Capitol Hill condo co-owned by the wife of a top energy lobbyist. Vicki Hart and her husband, lobbyist, J. Steven Hart, both confirmed the events. The EPA has since reimbursed Pruitt's former landlord, Vicki Hart, for the cost of the door. The EPA allowed Bloomberg News to review copies of canceled checks that Pruitt paid to the condo owner. The news outlet reported that the checks show varying amounts paid on sporadic dates -- not a traditional monthly "rent payment" of the same amount each month, according to Bloomberg. In all, Pruitt paid $6,100 over six months to the limited liability corporation for the Capitol Hill condo co-owned by Vicki Hart, whose husband J. Steven Hart is chairman of a top D.C. lobbying firm and who is registered to lobby for several major environmental and energy concerns. (Carolyn Kaster/AP, FILE) Environmental Protection Agency Administrator Scott Pruitt attends a meeting with state and local officials in the State Dining Room of the White House in Washington, D.C., Feb. 12, 2018. 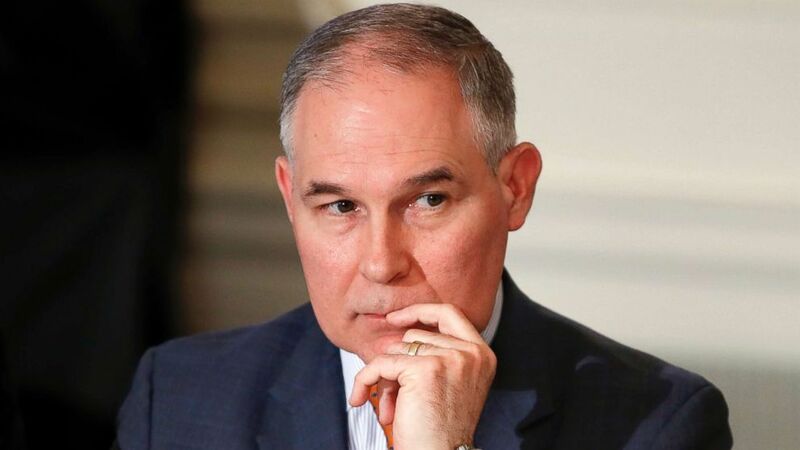 Pruitt and his staffers took nearly $150,000 in commercial and charter flights over seven-months last year, including repeated trips to Pruitt's home state of Oklahoma, according to travel vouchers obtained by an environmental group.